Looking for a new cover sheet for all your fax needs? A cover sheet will be the first thing potential partners and clients see when you transmit important information, so you don’t want to leave a bad impression. This business fax cover sheet Excel template can be used for your business fax needs. Not only is the template is easy to use, it will also give you the high quality professional look your company demands. The business fax cover sheet is also incredibly cost effective, as it is absolutely free. You can get this Microsoft Excel template instantly. The business fax cover sheet Excel template will be easy for people of any level of computer knowledge to use and understand. In the top corner you will notice a design of a fax machine. If you are happy with the design, feel free to keep it. However, this is merely meant to be a placeholder for the logo of your company or business. To remove the design, simply click and delete it. Meanwhile, the business fax cover sheet Excel template will automatically input today’s date once the template is open. The template is designed so that it is easy to type in all the important information. However, the sheet can simply be printed off and you can hand write all the info if you prefer. 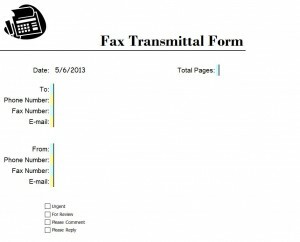 The next step will be to input the number of total pages the transmission includes, followed by the name of the recipient, their phone number, fax number and email address. Next, input your name, phone number, fax number and email address. You will then mark if the message is urgent, for review, or it needs a further comment or reply. Finally, add in any extra comments you may have, or leave the area blank so that they may write down comments.